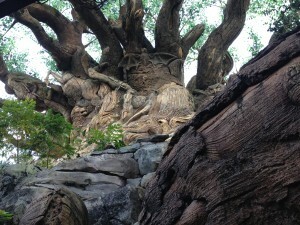 An example of character sculpting on the Tree of Life at Disney’s Animal Kingdom. This upcoming fall semester the Department of Art is excited to introduce a new course to students: Imagineering Production Techniques: Painting Environments. This course provides a continuation of “character plaster” and an introduction to “character paint”, a term associated with the painting and faux finishing of sculpted cement elements that mimics other materials, including rock work, themed paving, and architectural facades such as faux stone and plaster. Through class discussions of relevant readings and artists working in the discipline, we will investigate aspects of “character paint” and the potential application to student’s work and “real world Disney” projects. 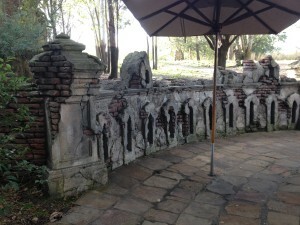 An example of character sculpting at Disney’s Animal Kingdom. In January, the Character Sculpting class traveled to Walt Disney World where they were exposed to character plaster techniques and met with artists from Walt Disney Imagineering. These experts lead the class in workshops and took the students exploring in Animal Kingdom to see in-process and completed examples of large-scale character plaster projects. Throughout the semester, students worked toward building full-scale pieces and guest artists from Disney Imagineering critiqued students’ works. Working closely with the Disney Imagineers allowed the students to gain a real-world perspective of character plaster. This exciting new course can be found on the course search as ART4928C Section 6. To apply for registration permission, students can email Jason Strom at jstrom@fsu.edu for more information.